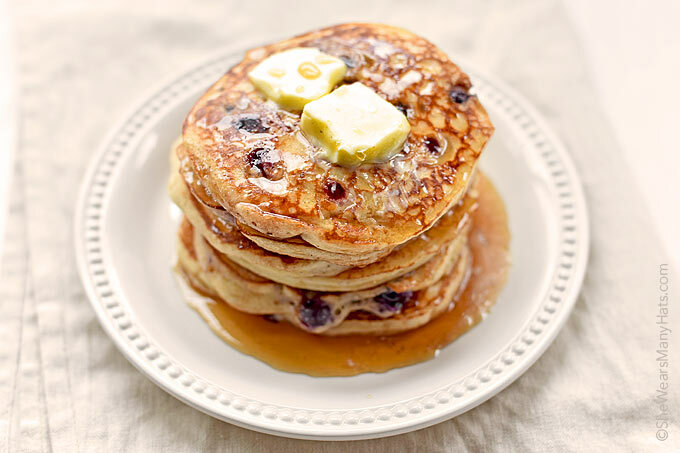 These delicious Yogurt Blueberry Pancakes will hit the spot for breakfast or brunch. Come on! Rise and shine and make some pancakes! Yes, you got up a little earlier than you would have otherwise, but pancakes for breakfast are worth it. The early bird gets the pancakes, right? After you have made plenty of the plain ones for the kids, it now time to break out the good stuff. The kids and their friends are content, quiet even, enjoying the plain ones. They just don’t know any better. They may request a sprinkling of chocolate chips added, if anything. Yep, they don’t know any better. But you can still treat yourself. Add some blueberries! Blueberries really shine in good pancakes. That unmistakeable sweet blueberry-ness comes through in every bite, and they look so pretty too. 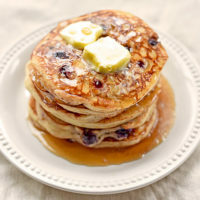 These Yogurt Blueberry Pancakes are made with the Yogurt Pancake Recipe base with a bit of fresh or frozen blueberries added. The dry ingredients can be mixed the night before to make prep time easier and a bit quicker come morning. I don’t know about you, but for me, measuring early in the morning pre-coffee or tea can sometimes be a challenge, so any prep ahead of time is good with me. Fresh or frozen blueberries will work for this pancake recipe. If using frozen, let them thaw before adding them to the batter. If needed, strain excess water too. Whether breakfast or brunch, blueberry pancakes will be a hit and have everyone ready to be the early bird to get the pancake. Serve these topped with more fresh blueberries, or perhaps an easy homemade blueberry syrup, maybe a dusting of powdered sugar, or all of the above if you’re feeling extra crazy! 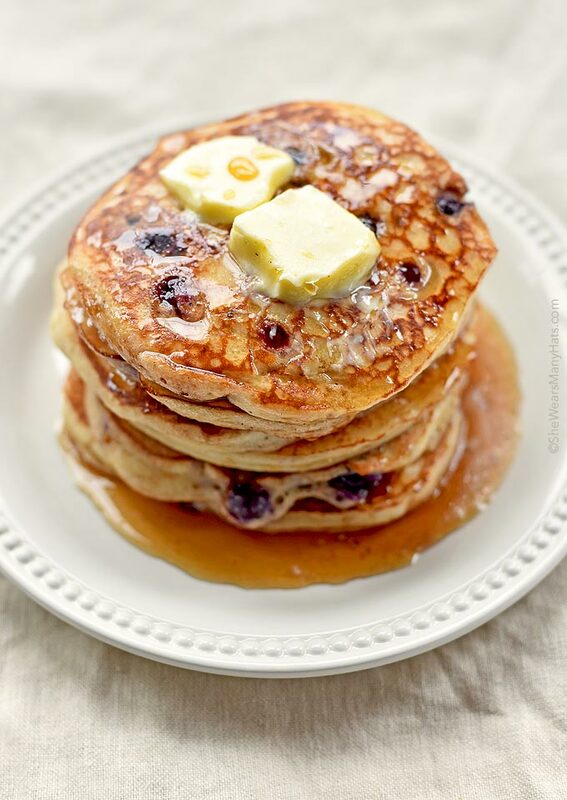 Delicious blueberry pancakes made with greek yogurt and blueberries. Originally published January 16, 2015. Yummy pancakes! I’m sure the Greek yogurt tastes awesome in these! 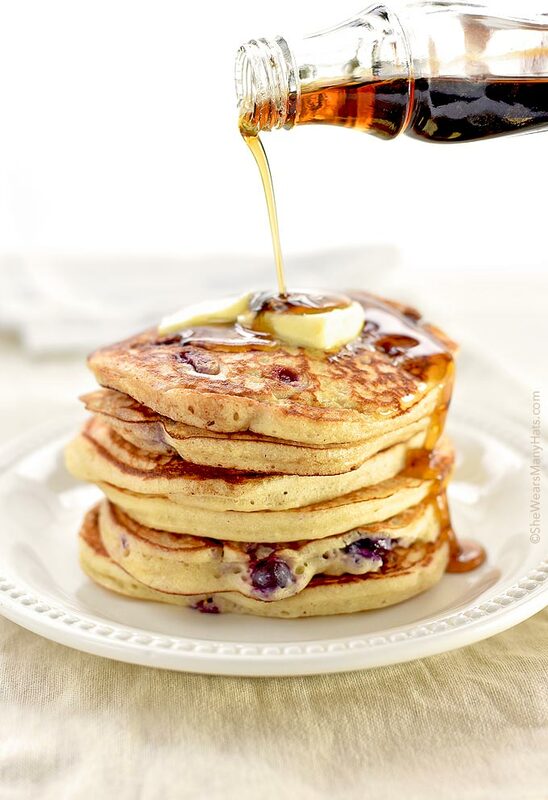 These blueberry pancakes look mouthwatering! Bring on breakfast! These look glorious!! I want a stack asap! I love that these have yogurt in them, this is an amazing breakfast! These look wonderful Amy. I’m with you Wenderly, want a stack! We pick the little wild blueberries and freeze for the winter. This recipe will be a perfect use. I bet you have great blueberries up there! Cinnamon! The secret of so many great recipes. It just adds that little something that is sometimes hard to put your finger on. Great idea. I never put cinnamon in pancakes before. It does add that little something. I like adding it to most baked goods, but it’s pretty fantastic in pancakes. Oh my, these are light and airy, I love them! Whoops! Editing the recipe now. Thank you so much for pointing it out to me. Is it just me or the batter is very thick. Just a big clump and can’t even swirl it in the pan. If your batter is too thick you can always add more milk to desired consistency. This recipe made such delightfully fluffy cakes and handled REALLY well on the spatula. a nice yogurt-y tweak to my standard pancake recipe (I only get to make then rarely!) so thank you! Didn’t see the mentioning of the honey in the recipe. Did I miss something? I REALLY enjoyed this recipe and had to tweak to fit my ingredients on hand. I DID use plain yoghurt but not greek. I used a whole milk premium. I doubled my recipe and only had 1 and 3/4 of a cup left, so I added vanilla kefir to make the full 2 c. We also used the rest of our whole milk but had to top with a touch more of kefir. We used fresh grated nutmeg in place of the cinnamon. Baby in the family has an adverse reaction but this was a nice alternative. Half way though, I added lemon zest and a tablespoon or two of the juice from a VERY ripe lemon. It did not over power but gave a nice finish. Our blueberries were ripe and fresh. Gave the perfect pop and flavor. OOPS! I also was out of honey and had to sub with granulated sugar… first time in over 25 years to be caught without honey on hand. Sugar worked just fine. Wow! Thank you so much for sharing. I just love your blog, it’s very useful. Your pancakes look very appetizing, I will try to cook them!